Excellent tour! The bus driver who picked us up was very knowledgeable about NZ itself and gave us information the whole ride to and from. Also the guide at Hobbiton had such extensive knowledge I was left wanting to re-watch all the movies to find all the little snippets and shots we were told about! I would highly recommend this tour and to book with Viator. This is a well run operation and the sets well preserved and maintained loved every moment of the tour our guide was knowledgeable and friendly. Highly recommend the ginger beer as beverage of choice. We had an elderly lady who used 2 walking sticks as mobility aids and she managed the whole tour although missed most of the commentary but she achieved the 2 hour walk and was pleased that she got to experience the atmosphere of Hobbiton. We had a most enjoyable experience and had lots of photo opportunities Well done to Peter Jackson and tne Alexander family.The only downside of this tour was we were travelling on a cruise ship and booked this tour based on the timing and our husbands who did not attend were expecting us back 1 hour earlier than we arrived, because the driver included a further side trip to a waterfall which whilst lovely was unexpected and we had no way of communicating this delay back to our husbands. Given that viator tours are usually very precise this put us on edge and was stressful. Had we not been on a cruise ship with tight deadlines this would not have been such an issue but felt the driver did not allow for unforeseen events such as a road accident which could have made us miss the ship because instead of arriving back with 2 hours to spare we arrived back with only 45 minutes to spare and to 2 stressed husbands and 2 stressed passengers which took some joy away from what, if the tour advertised was upheld would have been one of the most memorable excursion of our holiday. I know we arrived back in plenty of time but it still made us anxious until we arrived back to the ship due to not knowing whereabouts we were and how far we still had to travel. Tours should be stress free. 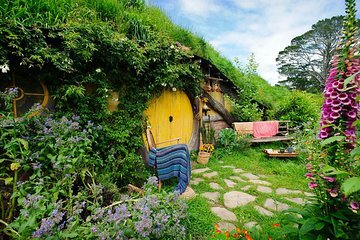 Recommend that you at least know what Lord of the Rings is about before visiting Hobbiton! Everything went as planned. They were there waiting on us as we departed the ship and got us back on time. The small tour bus picked us up at the cruise terminal -knowledgeable driver gave a running commentary of passing sites and history of the area. As we got closer to Hobbiton, she filled us in on procedures and farm's background. We use Viator for most of our tours around the world. This was one of our best. Hobbiton is fantastic to visit, and we were very happy with our transport. The only thing I would change would be to allow a bit more time to check out the souvenirs, but this is such a popular tourist destination buses are probably limited in the time they can stay. A bonus was a delicious locally made Icecream on the way back to Tauranga. The tour of Hobbiton was great and I highly recommend it. However, getting there was terrible. The bus was in poor repair. Hot/sticky day, no a/c or windows that opened. Terrible driver did not know how to shift the bus, so took longer than it should have to get there, which cut into time. I was NOT able to go on this Tour due to my husbands illness But my daughter Did Go .. She LOVED it ... was so well organized I'm wishing to do this in the near future Beautiful .. I'm looking to book more tours within your company !!!! This tour was better than I ever could have hoped for! Our driver was waiting for us at the dock and returned us to the ship in plenty of time. She entertained us throughout the drive. Our bus was clean and comfortable. 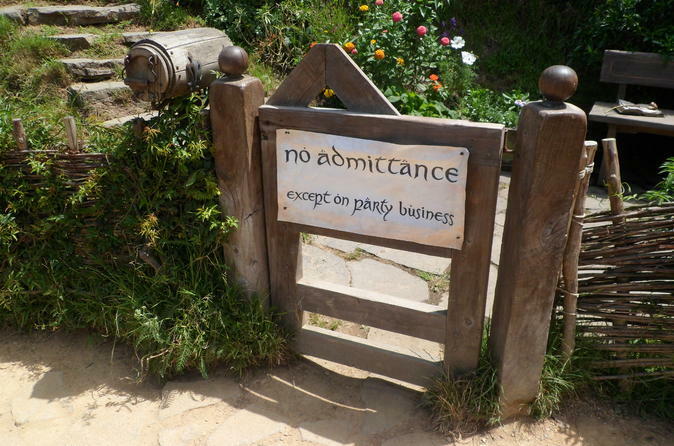 When we arrived at Hobbiton, I felt transported to the magical land of Middle Earth despite throngs of tourists. Our guide did a fantastic job and the landscape was simply gorgeous! I would highly recommend this for anyone whether or not they have any prior knowledge of LOTR!